Cape Leeuwin Lighthouse is situated at the most south-westerly point of Australia and it is the tallest lighthouse on mainland Australia. This famous landmark is over 100 years old and remains an important working lighthouse and collection point for meteorological data. Cape Leeuwin is also the point where the Indian Ocean meets the Southern Ocean. Recently, National Geographic named the Cape Leeuwin Lighthouse as one of the top 3 best ocean views in the world. This image belongs to the travel and nature stock photo library. This stock photo of Cape Leeuwin Lighthouse at Sunrise is available for licensing for commercial and editorial uses including websites, blogs, books, magazines, brochures and advertising. Restrictions may apply for images which contain third party copyrighted material or sensitive subjects. Photos of artwork are for editorial use only. 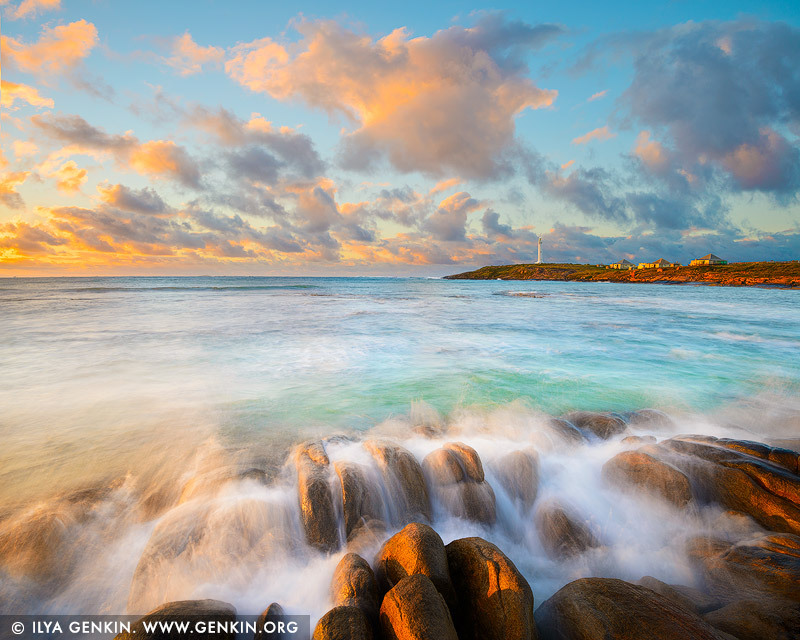 This image id AU-WA-CAPE-LEEUWIN-LIGHTHOUSE-0001 of Cape Leeuwin Lighthouse at Sunrise, is copyrighted © by Ilya Genkin. This is not a public domain image.